Making crafts based on children’s books is a great way to bring books to life for young children. National Book Lover’s Day is on August 9th so try celebrating with a trip to your local library and then have fun creating a book inspired craft at home. 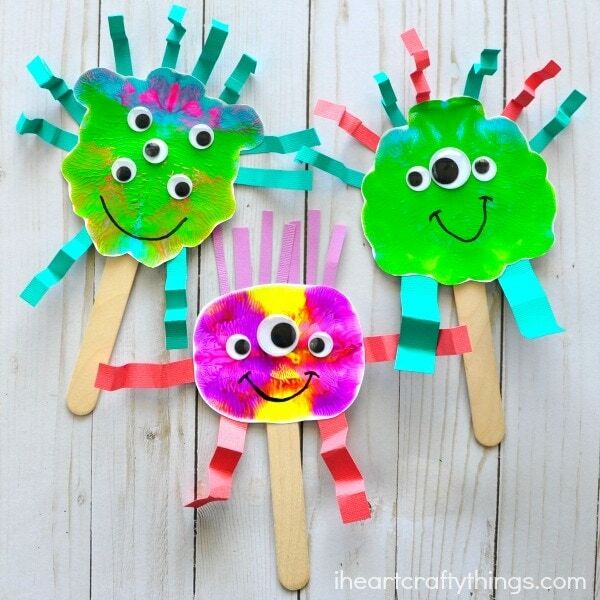 These silly paint smash monster puppets we are sharing today are a super fun process art activity for kids and they go along great with any monster-themed children’s book. Find some book recommendations near the bottom of this post. The best part of this craft is how it’s almost impossible to make only one monster. The smash painting process will keep kids enthralled and entertained for hours. 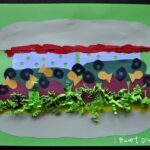 Kids will love making dozens of variations of blobs with different colors and amounts of paint. This activity also creates a great opportunity for children to learn their colors and delve a bit into color mixing. 1. Begin by folding your white cardstock in half to make a crease in the middle of the paper and then open back up the paper. 2. 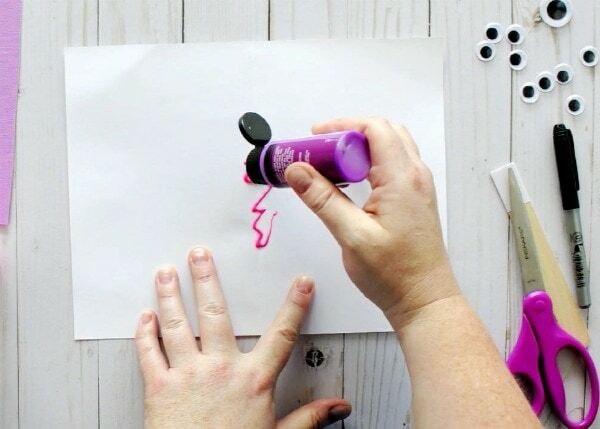 Add paint to the middle of your paper. Get as creative as you’d like with the amount of colors you use and the different designs you make with your paint. You can make swirls, straight lines, squiggly lines or dots. After adding your paint, fold your cardstock in half again and smash the paint down between the two halves of the paper to create your colorful, silly monster face. Use your fingers to rub the paper from the crease outward to spread the paint out across the paper. 3. 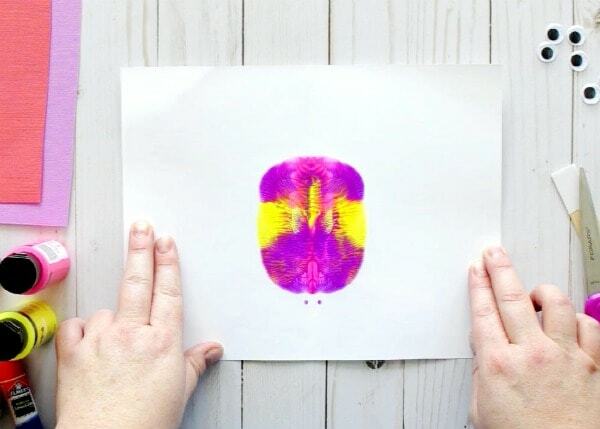 When you are finished smashing and rubbing your paint, open your paper to see the colorful blob that was created. Let the paint sit to dry completely. 4. When your paint is dry cut out your monster face and attach it to your jumbo adhesive craft stick. 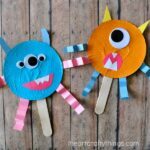 If you can’t find an adhesive craft stick simply glue your monster face onto a regular jumbo craft stick. 5. 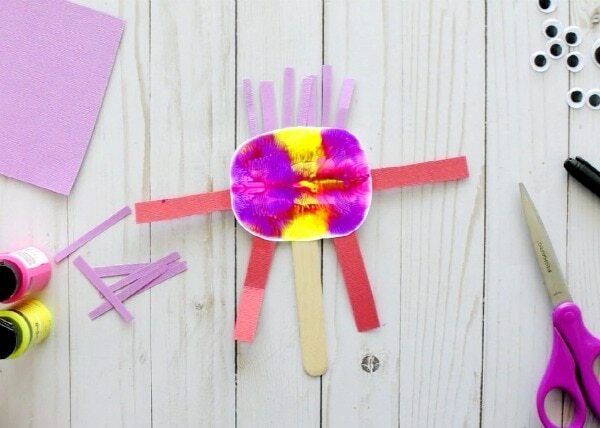 Cut out several different construction paper pieces to create limbs and hair for your monster puppet. Glue them onto your puppet. 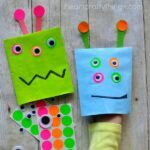 Give your monster puppet extra personality by bending and folding the construction paper pieces to add extra texture. You can add curls to the hair by wrapping the pieces around a pencil or add accordion folds to the arms and legs. 6. 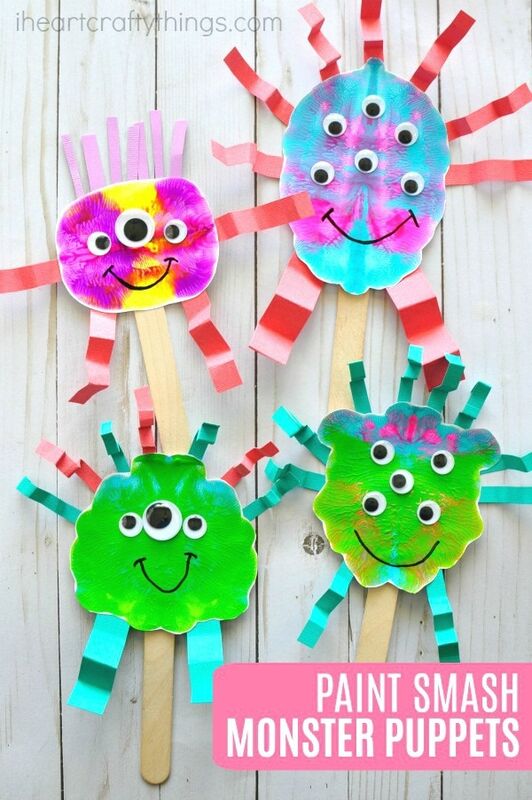 Finish your monster puppets craft by gluing on 1, 2, 5, 10 or however many googly eyes you’d like your monster to have. Then add a cute smile with your black marker. 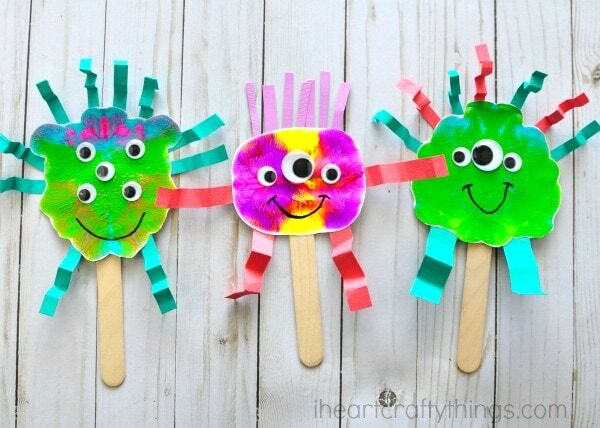 Now that your monster puppets craft is finished it’s time for play! Use your puppets to put on a special puppet show for Mom, Dad or with friends in the classroom. Have fun reenacting one of your favorite monster books or create your own story. Big Bad Bubble by Adam Rubin: This fun monster book is a giggle-induced read that helps teach children to confront and overcome their fears. The monsters in La La Land, Yerbert, Froofle and Wumpus are terrified of bubbles. They run away and cry when they see one. With the encouragement of the narrator (and the help of the readers) the three monsters learn how to triumph over bubbles. Monster Mess! by Margery Cuyler: This silly rhyming book is about a monster who doesn’t want to scare you, instead wants to clean up your messes. Follow along the monster in the book as he creeps through the house finding messes and tidying up. Leonardo, the Terrible Monster by Mo Williams: Leonardo is a terrible monster. When he attempts to scare others all he gets is giggles. He decides to find the most scardy-cat kid and scare the tuna salad out of him but when he does he feels terrible about it. Leonardo ultimately decides instead of being a terrible monster he’d rather be a great friend. 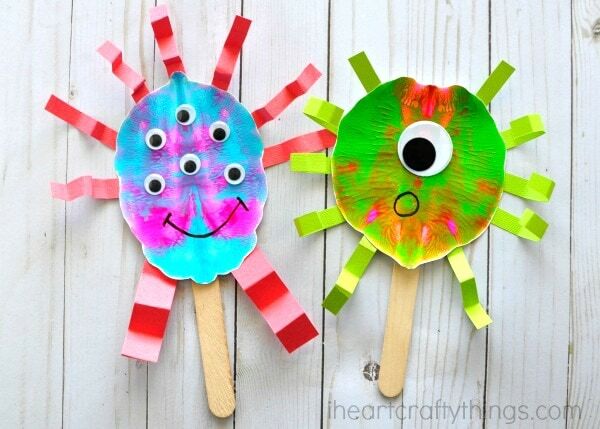 If you enjoyed our silly paint smash monster puppets you’ll love some of our other book inspired crafts. This paper plate Corduroy craft is always a hit and kids adore this blow painting technique to make Dr. Seuss’ Thing 1 and Thing 2.